Where are you hoping to get lucky in your sport or your work? Maybe you’re eyeing a college athletic scholarship or that fancy promotion that’s on the table. 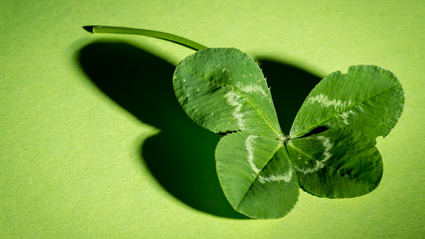 Most of us have a fundamental belief about luck: either we’re pretty lucky on average, or we’re that person that will never, ever find a four-leaf clover. Decide to work hard - and do it. Define what "working hard" looks like for you. To get your ideas flowing, we’re talking about putting in maximum effort, managing your time and energy, and stepping up to the plate when confronted with a challenge, among other things. Decide that you are willing to do what it takes to reach your goal. For example, something that sets Will Smith apart in terms of work ethic is that he's not afraid to die on a treadmill. Reflect on your experiences. Much of confidence is built by gaining experience and reflecting on your success and failure. Instead of letting those moments flash by, hit pause and really think about what you did that contributed to your success. How can you repeat those actions in the future? Also jot down a few notes about what led to you making a mistake or enduring a total failure. What would you like to do differently next time? Visualize your success. In preparation for a big competition or an important project deadline at work, integrate imagery practice into your day. Create an experience in your mind where you are succeeding and everything goes right. Incorporate all of your senses and make this as real as possible. But remember, "you can't just visualize and then go eat a sandwich." Build a performance routine. We’re not encouraging superstitions or rituals, but rather that you have a systematic routine - an established procedure that guides your mental and physical preparation. This is something for you to use leading up to every competition or work-related performance. Routines help create confidence and control, especially when there’s a lot of uncertainty, ultimately leading to improved performance. Be open to opportunities. Opportunities are everywhere, so keep your eyes peeled. But no really - how good are your observation skills? When you have a clear, well-defined goal and your preparation to reach that goal is on point, opportunities have a way of presenting themselves - if you’re paying attention. Be in the moment by "taking out the trash" when you’re with other people, working on your craft, and striving for greatness. Anyone can prepare for luck by having a goal, working hard, understanding their experiences, visualizing successful outcomes, building and utilizing a performance routine, and finding opportunities. Here’s to your luck! Abby Keenan is a certified mental performance consultant located in Atlanta, GA. She mentally prepares athletes to perform at their best when it matters most. To work with Abby on your preparation for luck, setting goals, developing imagery skills, or building a performance routine, click here.